A song cycle dealing with issues of loss and bereavement, but ending with a more uplifting message as in M.V. Lively's poem describing the a candlelight procession which took place in London in January 1988 in memory of those who died in the UK from AIDS. 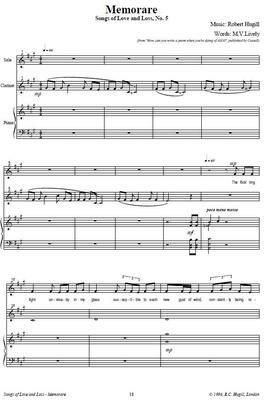 Revised version first performed by David Greiner (Counter-Tenor), John Cook (Clarinet) and Paul Webster (Piano) in March 1998. The last ten months of your life. What do you want to know about Songs of Love and Loss?